From the Hancock County Courthouse, go northeast on Hwy 22 for 7.5 miles to Springfield Church Rd. Turn left onto Springfield Church Rd and go 1.8 miles. The cemetery will be on your right with a chain link fence around it. Our Children: Robert W. Smith Jr. & Ruth L. Smith. No death date as of May 2002. On same marker with Ester B. Smith. Our Children: Robert W. Smith Jr. & Ruth L. Smith. On same marker with Robert W. Smith Sr.
Educator-Leader/ and Friend/ an Inspiration to All/ We Miss You. Children: Macio, Betsy, Lula, James, Johnie, Dorothy. On same marker with Lula R. Dixon. Children: Macio, Betsy, Lula, James, Johnie, Dorothy. On same marker with John B. Dixon. 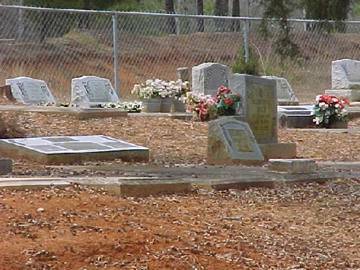 Recent grave as of May 2002. Age 59. Death date and age on Roberts Funeral Home tag. "Our Mother./ In Loving Memory." "God is my refuge and strength." "Eller"./ Children: Beatrice, Willie Dell, Bernice, Thomas, Mary Julia, Charles, Malvina, Clarence Jr., Robert. On same marker with Clarence Dixon. Children: Beatrice, Willie Dell, Bernice, Thomas, Mary Julia, Charles, Malvina, Clarence Jr., Robert. On same marker with Mrs. Mable L. Dixon. Month of death on funeral home tag. Children: Bonnie, George, James Jr., Billy, Ronald, Mary Marie. Information on funeral home tag: d. Sep 30, 1990, aged 66 years, 5 months, 22 days.